There’s an art and a science to casting your favorite movie roles. Amy Cook, Associate Professor in English and Theatre Arts at Stony Brook University, discusses how casting that goes beyond our expectations can bring new narratives to the forefront. Amy Cook is Associate Professor in English and Theatre Arts and Graduate Director in the Department of Theatre Arts. She specializes in the intersection of cognitive science and theories of performance and early modern drama. Her book, Building Character: The Art and Science of Casting (University of Michigan Press, 2018) argues that we build the characters of others from a sea of stimuli and that the process of watching actors take on roles improves our ability to “cast” those roles in our daily lives. 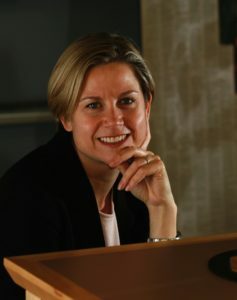 She has also published Shakespearean Neuroplay: Reinvigorating the Study of Dramatic Texts and Performance through Cognitive Science, (Palgrave Macmillan, 2010) and essays in Theatre Journal, TDR, SubStance, Journal of Dramatic Theory and Criticism and several edited volumes, including Bloom’s Modern Critical Interpretations. She has an essay in The Oxford Handbook of Dance and Theater (2015), and will have an essay in The Oxford Handbook of 4E Cognition (forthcoming). She teaches theatre history, Shakespeare, Theatre in New York, and seminars on cognitive approaches to the arts and humanities. Prof. Cook was at Indiana University, Bloomington from 2008-2014 and before that she was a Mellon Fellow in dramaturgy, directing, and dramatic literature at Emory University in Atlanta. We may not notice the casting of, say, Meryl Streep as Katherine Graham in The Post, but that doesn’t mean the choice of Streep didn’t make a very different Graham than had they cast Frances McDormand or Diane Keaton. To cast characters is to create them, to bring them to life, and control the spectator’s expectations about them. Casting is the reduction of dimensions. We do notice casting when it’s counter to our expectations. In March, Denzel Washington is coming to Broadway to play Theodore “Hickey” Hickman in Eugene O’Neil’s The Iceman Cometh. A traveling salesman in 1912, the character was written for a white actor, but Washington is not slipping into the part unnoticed; we are not supposed to “look past” his race. This production will succeed or fail based on the degree to which Washington’s casting brings different energy to this play about the attachment to illusion and the American Dream. When the body playing the part does not match the presumed race or gender of the character, we must question the central importance–the normality and invisibility–of the white male body. Like a female Lear or an African American Aaron Burr, counter casting is a way to shift the narrative and expand our categories of what race and gender mean, of who gets to play what part. Having experience with casting counter to our expectations in theatre and film can help us come to see our categories as flexible. We need to rehearse change to make change. When most of social media claimed, “#MeToo,” it felt like the role of sexual object got recast. These women coming together to form a group refused the narrative of the lone, silenced victim. Refusing to play the right part puts pressure on others to question the rigidity of their categories. Casting is creative and transformational, both on and off the stage.